This year, SPFT is doing something new with regards to professional development: the SPFT Professional Development Leadership Team became active on July 1, 2018. This team has been tasked with the purpose of working together to continue SPFT professional development course offerings while revisioning the local’s PD program. The team consists of the Team Lead, Kiesha Lamb, and four additional team members, Edward “Teddy” Kline, Jon Tufte, Megan Doerr, and Sarah Johnson, who represent SPFT’s membership. This team is collectively experienced across a wide range of areas that will positively impact our greater community. The new PD team has assembled to imagine more equitable processes, collaborative partnerships, and effective learning opportunities for all educators. 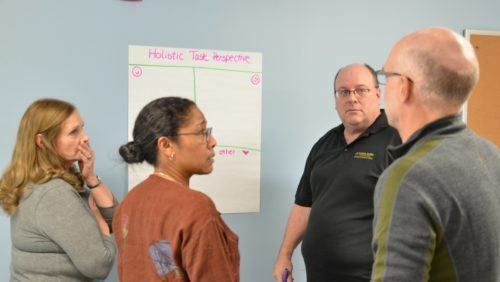 As part of their charge, the Professional Development Team is looking at the the content of SPFT’s professional development offerings through an equity lens. There will be no SPFT PD Courses offered during the fall of 2018. However, courses will be back up and running winter of 2019. Check PDExpress for updates. If you have any questions about SPFT’s professional development offerings or want to learn more about the PD Leadership Team, please contact the Teaching and Learning Center at tlc@spft.org. You can learn more about the team here. SPFT leaders take the Delivering Effective Professional Development course.